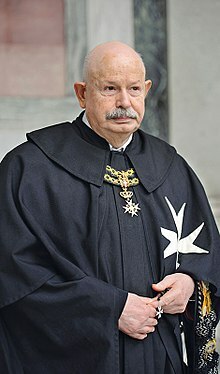 Fra' Giacomo dalla Torre del Tempio di Sanguinetto (born 9 December 1944) is the 80th and current Prince and Grand Master of the Sovereign Military Order of Malta. He was elected by the Council Complete of State on 2 May 2018 and took the oath of office on 3 May 2018. His full title is His Most Eminent Highness Fra' Giacomo dalla Torre del Tempio di Sanguinetto, Prince and Grand Master of the Sovereign Military Hospitaller Order of St. John of Jerusalem, of Rhodes and of Malta, Most Humble Guardian of the Poor of Jesus Christ. Born in Rome, dalla Torre is a member of a comital family originally from Treviso. His father, Paolo dalla Torre (1910–1993), an art historian, was Director General of the Vatican Museums from 1961 to 1975. His brother, Giuseppe dalla Torre [it], a lawyer, is President of the Tribunal of the Vatican City State and was formerly Lieutenant General of the Order of the Holy Sepulchre. His grandfather Giuseppe Dalla Torre [it] (1885–1967), a journalist, was director of the Vatican newspaper L'Osservatore Romano from 1920 to 1960. Dalla Torre studied Christian archeology and art history at the Sapienza University of Rome. He held academic posts at the Pontifical Urban University, where he taught classical Greek. He served as that school's Chief Librarian and Archivist. He has published widely on medieval art history. Dalla Torre became a Knight of Honour and Devotion of the Sovereign Order in 1985 and took vows as a Knight of Justice in 1993. In 1994 he was elected Grand Prior of Lombardy and Venice, a position he held until 1999. From 1999 to 2004 he was a member of the Sovereign Council. In 2004, dalla Torre was elected Grand Commander of the Order. In 2008, as Grand Commander, he automatically became Lieutenant ad interim (acting head of the Order) upon the death of the 78th Prince and Grand Master, Fra' Andrew Bertie, on 7 February until the election of the 79th Prince and Grand Master, Fra' Matthew Festing, on 11 March. On 24 January 2009, dalla Torre was elected Grand Prior of Rome. He was re-elected Grand Prior of Rome on 12 February 2015 and held the position until he was elected Lieutenant of the Grand Master in 2017. On 29 April 2017, three months after the resignation of Fra' Matthew Festing as Prince and Grand Master, dalla Torre was elected acting head of the Order of Malta as Lieutenant of the Grand Master. He held this position until 2 May 2018 when he was elected Prince and Grand Master. "La biblioteca e l'archivio di 'Propaganda fide': prospettive di ricerca". In Ordini religiosi, santita e culti: prospettive di ricerca tra Europa e America Latina : atti del Seminario di Roma, 21–22 giugno 2001 (Galatina: Congedo, 2009), p. 153–191. Frammenti di storia familiare, 2012 (with Giuseppe dalla Torre). Roma: Aracne, 2013. "Una scena rara e controversa della scultura paleocristiana", Bollettino dei musei comunali di Roma 19 (1972): 22–26. ^ "Fra' Giacomo Dalla Torre del Tempio di Sanguinetto elected 80th Grand Master of the Sovereign Order of Malta". Order of Malta. 2 May 2018. ^ "Fra' Giacomo Dalla Torre takes oath". Order of Malta. 3 May 2018. ^ a b "Ordine di Malta, Dalla Torre eletto luogotenente". La Stampa (in Italian). 29 April 2017. Retrieved 29 April 2017. ^ Reese, Thomas (14 July 2016). "'VatiLeaks': A foolish and embarrassing case". National Catholic Reporter. Retrieved 29 April 2017. ^ "Order of the Holy Sepulchre of Jerusalem, The Grand Magisterium of the Order". The Holy See. ^ McKenna, Josephine (29 April 2017). "Knights of Malta elect new leader as Vatican seeks to bury feud". The Telegraph. Retrieved 29 April 2017. ^ a b "Fra' Giacomo Dalla Torre del Tempio di Sanguinetto elected Lieutenant of the Grand Master of the Sovereign Order of Malta". Order of Malta (Press release). 29 April 2017. Retrieved 29 April 2017. ^ "Elezione del Gran Priore di Roma". Ordine di Malta Italia. 18 February 2015. ^ Conti, Paolo (29 April 2017). "Ordine di Malta, Fra' Giacomo Dalla Torre nuovo Luogotenente generale". Corriere della Sera (in Italian). Retrieved 29 April 2017. ^ Smith, Sean (29 April 2017). "Knights of Malta will return to Rome in a year after electing a temporary leader". The Tablet. Retrieved 29 April 2017. The new lieutenant will have exactly the same powers as a grand master. This page was last edited on 5 April 2019, at 19:10 (UTC).